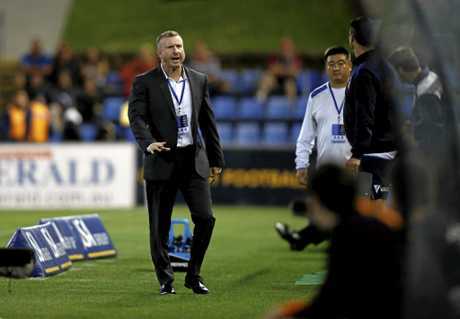 NEWCASTLE Jets lost their captain and their coach and their finals hopes may have suffered a fatal blow in the process after a controversial loss to Brisbane at McDonald Jones Stadium. 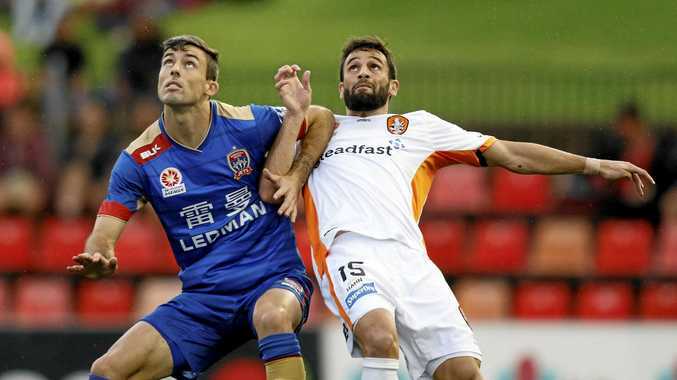 The Roar scored three second half goals with striker Jamie Maclaren netting a double to overrun the Jets 3-1. It was only Newcastle's second loss at home this season and it could be a telling blow to their finals hopes with the Jets pushed back to eight, still three points adrift of the top six. The game was turned on its head at the 30 minute mark with the home side leading 1-0 following the controversial sending off of skipper Jason Hoffman. Booked for dissent only moments earlier after disputing a foul and slamming the ball into the ground, Hoffman was giving his marching orders by referee Jarred Gillett for what appeared a highly dubious second yellow on Manuel Arana just outside the Jets box. 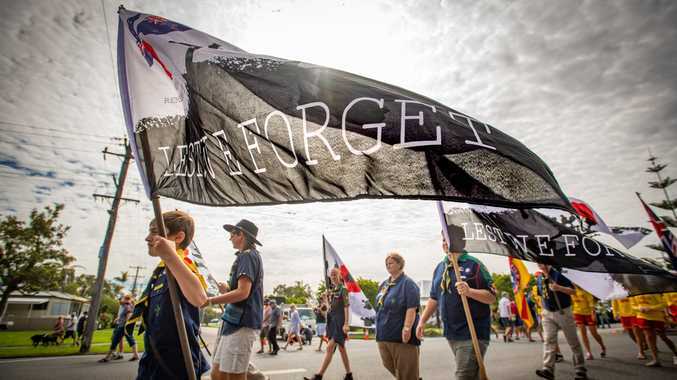 The red card brought howls of protest from Jets players and home fans but that wasn't the end of the drama. Jets coach Mark Jones exploded on the sideline, remonstrating with fourth official Shaun Evans and found himself banished from the sideline after Evans conferred with Gillett. Despite the controversy, the Jets clung to a 1-0 lead at the break. The goal came early and largely against the run of play with Brisbane the more enterprising in the opening minutes with Jamie Maclaren a real target up front. But on one of their first forays deep into Roar territory, the Jets struck. Hoffman snaked across field beating a couple of defenders before finding Daniel Mullen with a short pass on the edge of the box. He dinked it through for Aleksandr Kokko who was brought down from behind by Corey Brown with Gillett having no hesitation about pointing to the spot. Andrew Nabbout stepped up for the Jets and sent keeper Michael Theo the wrong way to convert for a 1-0 advantage. Maclaren continued to pose a real threat up front and could easily have had a couple of first half goals. He shot wide once or twice and just failed to get on the end of a dangerous Tommy Oar cross on another occasion. But Hoffman's send-off changed the complexion of the game. It forced the Jets onto the defensive and while they were brave, it seemed only a matter of time in the second half before they would be picked off. 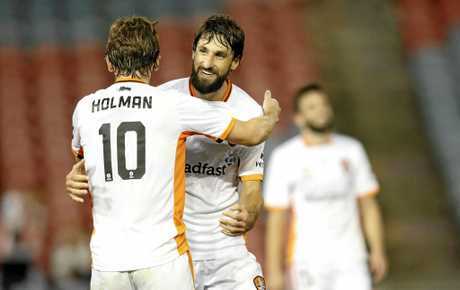 Maclaren equalised from the penalty spot 62 minutes in after Andrew Hoole manhandled Thomas Broich in the box following a corner. By that stage the Jets goal was under siege. Keeper Tomislav Arcaba produced two quick-fire saves to deny Maclaren and Brett Holman soon after but the Roar finally grabbed the lead when Maclaren was on hand to put away his second after Arcaba had blocked a long range effort from Arana.